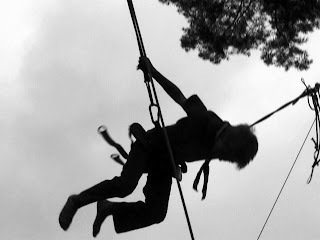 Above : Bungee trampoline - best to try this before lunch, not immediately after, as some scouts quickly found out. An earlier start than usual on saturday for the staff due to a day visit from over a hundred members of a West Lothian scout group and some of their parents. Fordell staff rushed down their breakfast of gruel and diluted water and headed off to set up all the activities and assist with parking the many cars in the car park. At 10am everything swung into action with most site activities being run by the 13 staff present. 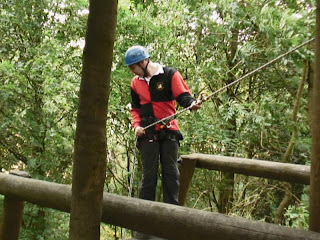 Weather was good with some activities (such as abseiling) being very popular with the kids and their parents alike. Due to each activity lasting only one hour instead of two there was a mad rush between bases on the hour, but everyone soon got used to it. As usual there was a good competitive and friendly atmosphere between the older and younger generations, particularly at the climbing wall where some of the dads almost caused themselves injury by proving they could get to the top of the overhang. Above : A horrified Coco looks down nervously as a huge angry spider slowly climbs up his abseil rope. After a brief lunch break, there were a further 4 hours of activities in the afternoon, followed straight away by some more bases, food and a campfire before everyone headed back home around 9pm for a good night's sleep, staff included.